Chavanga Fish Blog: Taimen fishing. Giant fish. Tugur river. Habarovsk region. 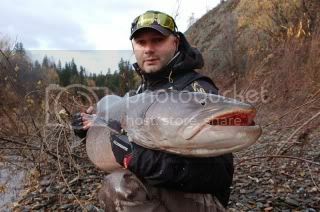 Taimen fishing. Giant fish. Tugur river. Habarovsk region. 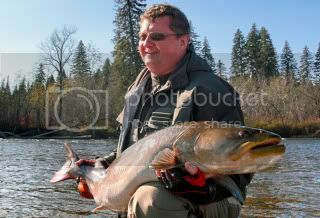 But small fishes in weight in 10-15 kg do not eat salmons and continue to be caught. 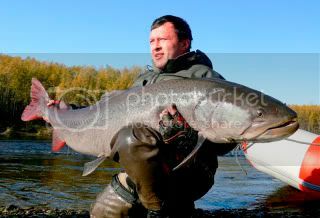 By the autumn taimen becomes more active and is fed before ice occurrence on the rivers. 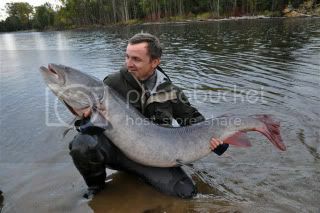 Fish quickly grows, by 10 years reaches 100 sm and weight in 10 kg. From now on it becomes a predator and eats fish, birds, small mammals. 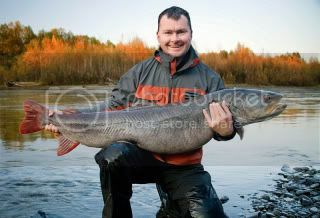 Usually fish catch on large fluctuating lures and large wobblers. Advise to use dim, copper or dark baits. Last years use large mouse for catching on a surface.Medium-sized fish in length about metre comes across often on the easy tackle intended for lenok or grayling. In comparison with with a bait for a spinning the fly loses in mobility. 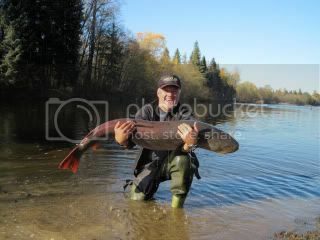 Therefore for flyfisherman there is absolutely other problem. It is not necessary to work on the areas, on it too much time leaves. It is necessary to choose the best, most perspective points for fishing. These are places where taimen it is fed, instead of has a rest, we search and it is caught active fish. More often it is a mouth of inflows, inputs in holes after rifts, merges a channel, inputs in old channels of the rivers. Therefore for fishing on a fly the season begins with the end of June when taimen stays on superficial water. Active fishes give out often themselves leaving to a water surface for small fish. It is an opportunity for fishing on superficial baits. If traces of surface activity are not present , it is necessary to fish thickness of water, trying to spend a fly deeper. It is clear that technically it is difficult. 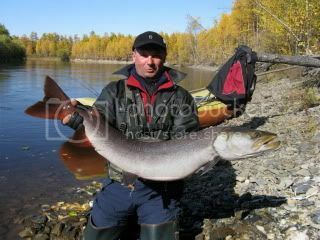 In the autumn fish, especially large copies, become in deep places, which are a little accessible to fishing on a fly. But anyway, it is possible to count on exits of fish to a surface on the artificial mouse at night. 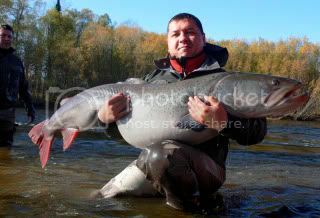 Here are photos of Tugur river and its hucho. A lot of very nice shots by my friends Oleg, Alex, Mikhal during 2011-2012 years trips. Yearly July and late September- October. oh my! what a fish!! Well, am I getting it right that you travel a lot? Or you live in Russia? Anyway, I should draw your attention to the service that will make your stay abroad more comfortable for your business - vdr virtual data room . With the help of this tool you may have access to all your documentations from all over the world.